We had quite a bit of drama in the Cromwell household this week. On Sunday, we were walking the neighborhood and suddenly a little white Chihuahua was following us. Of course our daughter couldn’t go home without pouring her love all over that dog. He instantly attached himself to her and basically wouldn’t leave. I was determined to NOT adopt this dog. My wife can’t stand these tiny not-a-dog’s (as she calls them). Plus we have two cats that he’d make life a living hell for, and two chickens he’d probably love to make his dinner. So he had to go. Our daughter begged, but just to the limit. She was actually really good and understanding that we couldn’t keep him. That didn’t stop her from naming him Finn, and spending every breath of her day with him. I put signs out, put an ad on Craigslist, and hoped and prayed the owner would show up by morning. I promised my wife he’d be at the animal shelter by the end of the day on Monday. Of course, that’s before I learned that it’s closed every Monday. So when the owner didn’t show up Sunday night, or Monday, we ended up having him around much longer than anticipated. I didn’t mind so much, my wife hated it, and our daughter — well, like I said — she spent every breath with him. Snuggling him, feeding him, playing with him. He was suddenly the most important thing in her life. My next concern was that I had heard that often, the Animal Shelter doesn’t keep the dogs very long and ends up putting them to sleep. I’d never live with myself if I took him there to his death. Of course, if I told our daughter that, she’d disown me on the spot too. So I called around. One non-profit animal rescue center told me the shelter would put him down 2 weeks after he went up for adoption. Well crap. That’s not going to work. But they also told me the best way for the owner to find him is for us to take him there, sign-up to adopt him, and if the owner doesn’t show up then we can bring him to them. What they didn’t tell me was it was $69 to adopt. Oh my goodness… this girl is kind of perfect, in that “You’re making life hard in all the right ways” kind of perfect. I couldn’t argue with her logic. Yes, ideally, if he were my dog, I’d want him to come back to me. Had I done everything I could do? Well, getting him to the shelter was really the best way to get him back to his owner. Maybe he had a chip and they could track down the owner. No way to know unless we brought him in. So I doubled down, gently, but firmly, that it was in Finn’s best interest to go to the shelter. She would have to learn to let him go. I wish you knew what I know about my daughter. “Letting go” is not in her vocabulary, except as a Disney song in which she only knows those two words and sings them all day long. But “remember” is one of her favorite words. And not like “Remember when we did this awesome thing! ?” No, it’s more like: “Last time we went to the park, you made me slide down the hot metal slide and I got burned. REMEMBER! ?” Ya. For her it’s not nostalgia, it’s a remember-threat. Still, she had “let go” gracefully before. 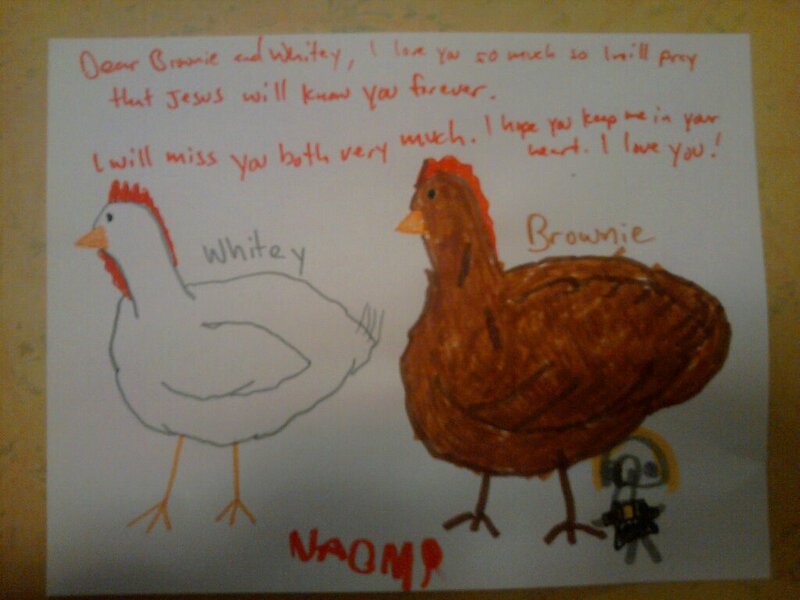 When our chickens got eaten by a racoon in the night, she mourned them, cried her eyes out, made a sweet card for them and moved on. When our rabbit got diarrhea and died in less than 24 hours, she mourned, cried her eyes out, made a sweet card and moved on (kinda…). Um… just want to clarify that we love animals and they don’t normally go to our house to die. Kinda sounds that way at the moment. So we had the letting go talk. I did my best. I think it was actually comforting for her to hear that Finn’s BEST chance of finding his owner was coming to the shelter. 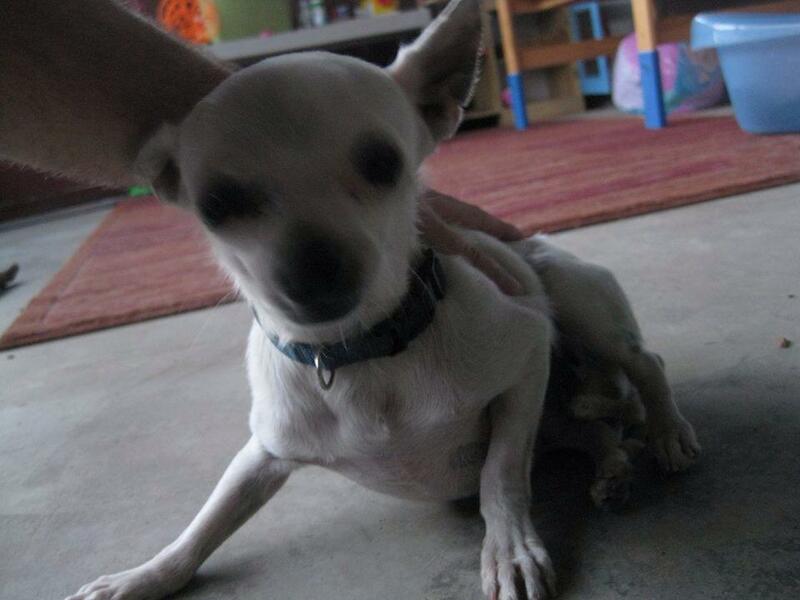 So the week passes, it’s Saturday — the day we become eligible to adopt him — and no word from the owner. It was clear now that we would have to go and save this not-a-dog from certain medicinal death. Still, I needed to make sure I could take him directly from the shelter to a rescue center and not have him sleeping over again. Of course, the Animal Shelter is open Tuesday through Saturday, but most rescue places are open Monday through Friday, or don’t even have an office at all. So, a bit frustrated, I email “Second Chance Dog Rescue” on a whim and said : “Hey you said you’d take him if he doesn’t get adopted. Here he comes! Where are you?” They replied immediately saying it’s not true at all that the shelter would kill him, and I should tell them his animal number and they’d go check him out and add themselves as the adoption of last resort. Hm… Well that changes everything. Basically, if you want to be a good Samaritan to a dog, good luck! There’s no awards or maps to motivate you or navigate you through the system. There’s misinformation and death threats, all while puppy dog eyes and 7-year old tears are bearing down on you. But the bottom line was I had already promised the kids that we’d go see Finn, so we needed to do that. But now the story was that he would be fine there until he found a home. So this visit would be to say goodbye. Forever. This was it. Now our daughter was prepped/ She knew that we were saying goodbye and wishing Finn a good journey. We found his pen, which he now shared with a 5 month old brown Chihuahua. We found out he was actually 5 years old (he’s CRAZY tiny). And we found out that because we were no longer interested in adopting, the staff couldn’t be bothered to open the pen for us to hug him one last time. So our daughter had to say goodbye through the bars. She stopped and pet each dog in each pen like she was giving them a Catholic blessing. Mother Teresa of the Dogs. Later, as we left, she also blessed each cat, kitten, rabbit, bird, and mouse we encountered. She was holy water sprinkled on every head of every animal there. It was beautiful. My daughters love of animals is pure. It’s real. She was also sincerely frustrated that they wouldn’t open the pen. I really understood that. It was a justice frustration. It was a frustration born out of solidarity. Her love of this animal made her a stronger person, not a weaker one. But when we got to Finn, she fell on her knees, squealing and crying and playing and laughing like there was no end. He’s who she came there for that day, and she wanted to make sure he knew it. Friends. I choked down more tears than I have in a long time. I think the biggest thing I learned in this whole experience, is that whenever you “teach” your children something, they always teach you back. I wanted to teach Naomi how to “let go”, which I think we made progress on for sure. But in return, she taught me how to love deeply. No amount of letting go held her tears back in saying goodbye, and I think that was exactly right. Next Next post: What is Buttery Scrolling All About? You’re touching on a whole lot of issues here, I’ll try to make this as short and as summarized as possible. If you find a dog, you can’t just decide to keep him, just as you can’t “find” a car you like parked on the street and bring it home. It’s called ‘theft’, and you can potentially be charged criminally and sued civilly, although it’s clear you’re trying to do the right thing. First you need to have the dogs scanned for a micro-chip at a vet or anywhere else. All responsible owners microchip their pets, it’s $25 and usually done at adoption. There is no excuse for a pet not to be microchipped, unless the owner is involved in criminal activity such as dog fighting. In San Diego County, only the SD Shelter can give you “clear title” to own the dog, and that’s by holding the dog for a minimum of 4 days, and offering him for adoption. You can get “first dibs”, but if you don’t, the professionals there will essentially determine the dog’s “market value” based on his age, breed, health, temperament, color, etc. If he’s likely to be adopted, he can be kept 2 months or longer before being killed. If he’s old, unhealthy, or an unpopular breed, he can be killed after 4 days. BTW, this was almost changed to 3 days by a-hole Governor Schwarzenegger in order to save a tiny amount of money, but activists fought this. It sounds like you’re unfamiliar with “rescue groups”. Every person or group in the US claims to be a “rescue group”. Sometimes it’s what you think, people who try to save specific breeds of dog, but very often it is an elderly person who is stuffing 50 to 150 dogs into a small 2 bedroom house where they live in their own feces until they die of dogfight wounds or disease. This is a HUGE problem everywhere, and just a couple of years ago an elderly woman was found in San Diego with 150 dying, diseased boxers forced to live in squalor in an unventilated 2 BR house in east county. She thought she was “saving” these dogs by taking them from shelters. What your daughter can learn is that all of this is caused by stupid and irresponsible people, who 1) buy dogs from breeders instead of adopting dogs on death row 2) take care of pets you have by microchipping and not allowing them to run loose. Have her take part in protests of pet stores who sell dogs while 4 million a year are put to death.